Who should be the No. 1 overall seed in the 2013 NCAA Tournament? Even as so much of the talk regarding Selection Sunday is focused on who gets in and who gets left out in the cold, the discussion regarding who gets the No. 1 overall seed is very important. After all, the No. 1 overall seed is essentially set in place as the favorite to win it all and thus is rewarded with what is considered to be the "easiest" road to the championship by the selection committee. And in my opinion, there is only one choice to get the top overall seed, and that team is the Louisville Cardinals. Why Louisville? Well, they only come into March Madness as the hottest team in college basketball. Since having three losses in a row in late January, two coming on the road, Louisville has won 13 out of 14 games, with the one loss coming in that insane five overtime classic in South Bend to Notre Dame. If that is the only loss in the past two months, that is a pretty darn good thing and I think one would consider that to not be a standard loss. Those final three wins came in the 2013 Big East Tournament, which the Cardinals dominated in its final incarnation. As we have seen from history, the Big East tournament is pretty rigorous and tough to win, and for Louisville to go in and dominate the competition, not losing any game by less than 12 points. Their performance against Syracuse last night in the Championship was really impressive. At one point, they were down by 16 points to the Orange, who started off pretty hot, but they closed with an incredible 49-16 run and they held Syracuse without a field goal for a stretch greater than 10 minutes. You cannot play much better basketball than that. And without a doubt, the Cardinals pass the eye test. They are deep and very talented. They have one of the top interior defenders in Gorgui Dieng, who was the Big East Defensive Player of the Year. 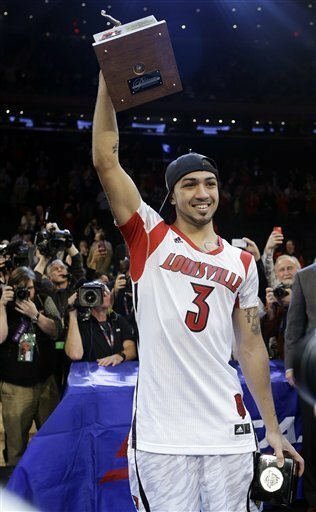 Russ Smith and back-to-back Big East Tourney Most Outstanding Player Peyton Siva form a tremendous backcourt that is a nightmare for opposing offenses. Forward Chase Behanan was the Most Outstanding Player of the West Region just a year ago. The depth is very strong and is led by guard Kevin Ware and forward Montrezl Harrell, who was awesome last night at MSG. And you can never count out a Rick Pitino squad. All of that put together, considering that Indiana lost yesterday in the Big Ten Semifinals to Wisconsin, and I think that is a strong resume to get the No. 1 overall seed.